The Philippines remains a safe and fun destination for all tourists. Both domestic and international transport in the Philippines is readily available and continues to be operational, with the usual travel considerations when traveling around the world these days. The Philippines has a great majority of touristic offerings, whether one is looking for natural wonders, historical landmarks, culture and tradition, arts and crafts, shopping, recreation and entertainment, among many others. Tourism activities are based in many of the country’s different regions, each with its own feature destinations and products. The Visayas region, plays host to several top destinations such as Boracay, Cebu, Bohol, Iloilo, and Bacolod, which remain open for business with their respective ports of entry still accessible to tourists. Having one of the world’s longest coastlines, the Philippines offers an array of limitless attractions found all over her more than 7,100 islands. Islands such as Boracay, are consistently cited by international travel publications as having some of the world’s best beaches, serves as a must destination for water sports activities, enjoyment, and relaxation. Looking inland, our country’s varied landscape also offers breathtaking natural sights from the Chocolate Hills of Bohol, the perfect cone-shaped Mount Mayon in Albay, to the world’s smallest volcano of Taal featured in the international bestseller 1,000 Places to See Before You Die. 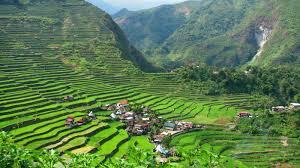 While our 2000 year old Banaue Rice Terraces, a UNESCO World Heritage Site, continue to be regarded by many global experts as a celebration of our people’s genius and soul. You can also try an adventurous trek to Mt. Pinatubo in Pampanga or Mt. Apo in Davao or swim with the gentle giant whale sharks in Donsol, Sorsogon; explore the Puerto Princesa Underground River, one of the New 7 Wonders of Nature; or dive at the Tubbataha Reef National Marine Park, another World Heritage Site in Palawan. There are also a number of noteworthy museums and art galleries in Metro Manila and in the provinces, showcasing the rich history and culture of the Philippines. Moreover, Metro Manila, Cebu, and Boracay are some of the places to be to enjoy the nightlife in the Philippines.